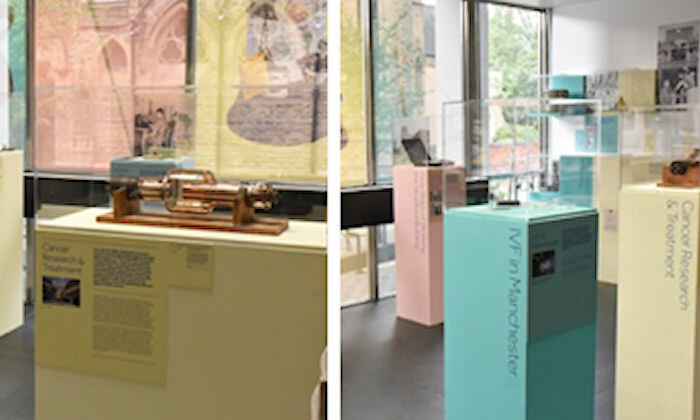 The University has a long history of medical research, teaching and breakthroughs, and this is now being celebrated in a new exhibition, which opened to the public this week in the foyer of the Stopford Building. The brainchild of the Faculty’s Social Responsibility Team, Instruments of Change has been created to highlight Manchester’s medical innovations and individuals’ contribution to patient care by showcasing objects from the University’s Museum of Medicine and Health, a unique collection of historical medical instruments and equipment. The exhibition also supports the nationwide NHS at 70 Project, more details of which can be found at https://www.nhs70.nhs.uk/. Here you can listen to the stories featured in the Instruments of Change exhibition, discover more, or share your own NHS story. Why not visit the exhibition next time you’re visiting or passing the Stopford Building? Alternatively, if you are interested in finding out more, or would like to access items from the collection, visit the museum’s website at www.bmh.manchester.ac.uk/museum/ or contact medical.museum@manchester.ac.uk.